Taking Your Business to the Next Level. After turning about 10 transactions, here is what to do next..
Jack Butala: Welcome to our show this Friday. 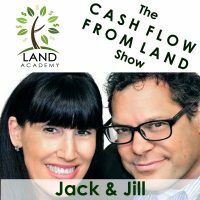 In this episode, Jill and I talk about taking your business to the next level. Before we get into it, let’s take a question posted by one of our members on LandInvestors.com online community. It’s free as always. Jill DeWit: Cool. Chip asks, “Hi, land peeps.” I love this. I really like that term actually. Land peeps is cute. All right. “I just received an accepted offer for $4,440 on 40 acres in Arizona. The lowest sales price comps are around $20,000 on LandWatch. My plan is to quickly flip for around $10,000. Jack Butala: That’s a good plan there. Jill DeWit: I love where this is going. “While doing my due diligence, I found the tax assess value was only $1,200, but the market value on the assessor site was $8,000. Should I be concerned I’m overpaying? My gut tells me it’s still a good deal. Jack Butala: May I, Jill? Jack Butala: Listener, please stop what you’re doing and retain this forever. The assessed value of a piece of real estate has nothing to do with its market value. Nothing, nothing, nothing, nothing, nothing. Nothing to do with its market value. At the assessed value is a fantastic way to relatively gauge what it’s work next to another property in the same county, but it has nothing to do with what you can sell it for. Nothing. Chip, go with your gut. If properties in this area are selling for $20 grand and you’re going to sell yours for 10 and you bought it for four, I think you’re right on the exact path to this program and what this program is all about. You can take the same math and add a zero to each number, or add two, or three, or four zeros like Jill and I do. Now you’re buying it for a million, or 4 million and you’re selling it for 10 million and it’s really worth 20. That’s how we apply this. You’re off to a fantastic start. I remember when you joined it. You’ve been super diligent about this whole thing from start to finish. Please retain this. Forget about the assessed value. It has nothing to do with what it will sell for. Jill DeWit: Perfect. Isn’t it funny? I remember talking to people and now it’s second nature to them. Jill DeWit: Yeah. Now it’s not a big deal. They’re like, “Yeah, you’re right. Okay, I got this.” It’s so funny. 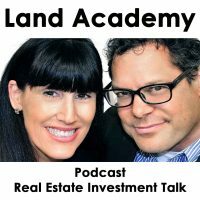 Jack Butala: Do you have a question or you want to be on the show, reach out to either one of us on LandInvestors.com. Today’s topic, taking your business to the next level. For the record, full disclosure, I didn’t write this title. Take it away, Jill. Jill DeWit: Any little thing like that. “Am I telling my wife to quit her job? She can help me here.” Whatever it is. Please tell us first, at what point do you think people should start thinking about this? Then what do they need to do to transition? Jack Butala: This is a great question. Now that you phrase it like this, now I actually understand what this show is about and so does everyone else. Jack Butala: From learning, to deal number one, getting past the first deal, all the way up to deal number ten, basically these are guidelines. You can take this literally, or you can apply it to yourself liberally. I want you to work inside of a closet somewhere with a computer turned on in the middle of the night. I don’t want you to spend an extra dollar on anything. I don’t want you to buy business cards. I don’t want you to incorporate. I don’t want you to spend any money at all until you’re done with about deal ten, between one and ten. Be as frugal as you can. Learn how to use data, and learn just the basic, basic 101 stuff about buying a piece of real estate for half of what it’s worth, and then reselling it hopefully for, even then, 60, 70 percent of its worth. Then the person you sell it to, they go sell it for a ton. At that point, when you come back out of that dark closet, and you probably need a shower real bad, and you’re malnourished, then that’s what this show is about. Taking your business to the next level. You’ve decided and you’ve checked it off your list. You like doing it, you like the computer piece of it, you like data, you understand Excel. You probably did way before you go to us. You’re staring at a bunch of money in the bank. You’re probably also shaking your head going, “Man, if I had this I could have done 20 deals. If I had this, I could have done 40 deals. If never worked with my wife, oh my God, I could have done 60 deals.” Every person is different about this stuff. Jill DeWit: Ha, ha I got that by the way. Jack Butala: “If I just yelled at the dog a little louder, this would have been a lot easier.” Stuff like that. Once you’ve got that worked out in your head, there’s a bottleneck to everything, right? There’s bottlenecks and there’s … After your tenth deal you’re going to realize the parts of the business that you love, and the parts that you can’t stand. Excluding data, because you do have to do that yourself. Jack Butala: Then you’re going to outsource that stuff. There’s only two ways to do it. You’ve utilized the resources that people like us provide. I’m not hocking our own stuff. There’s other people that provide resources. If those people are better do it, but choose one of those. Either resources from other people, or you outsourced it to somebody else like a V.A., which I do not recommend almost ever. Or you hire somebody. Hiring somebody and using outside resources almost is always the answer for us. Well, it is always the answer. There’s graphic stuff that we do that, for me, that we outsource because we could never … It doesn’t matter. The question is this, if I really need X to double my revenue … If those are the kinds of questions that you’re asking yourself right now, you need to take your business to the next level. You probably have the answers. 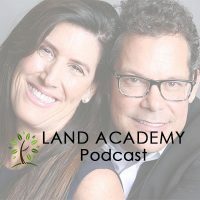 “I need someone to do this for me, but I don’t have time to train them.” That’s what LandAcademy and LandInvetors is all about is providing these resources and tools to help you efficiently take your business to the next level. Here’s a basic concept, we’re doing this stuff anyway. We’ve been doing it for 20 years. We know how to do engineering and sales probably better than anybody in the business. Jill and I decided a long time ago, let’s just share it. If you’re a sober member at LandAcademy and you’re doing more than 10 deals a month, you need to be a gold member. That’s really what this show is about, right Jill? Jack Butala: Yeah, is it more expensive? Heck yes, but it’s way less expensive than … Utilizing the resources that gold members use is way less expensive than hiring a person. It’s like less than half, way less than hiring a person or hiring a V.A. for that matter. Why? They’re tailored to this business. They’re perfect. They’ve been tested, and retested, and tested. We’ve failed at all this stuff long before we released these products. It’s the same stuff that Jill and I use. That’s what taking your business to the next level is all about. It’s all about something is holding you back, and now you’re ready to blow it open. For us it’s engineering. There’s two things that hold us back in a pretty big way. Engineering, which is, “Okay, great. I look up this property, it’s awesome, I want to buy it. The guy wants to sell it. I know it’s worth half of what it is. I really need to post it.” I need to take the assessor parcel number, make some maps, do some cool stuff, write a description, find out how much the taxes are. Post it on the internet all over the place and sell it. That takes days when you’re new. The product that we’re about to release, within days actually, makes that a five second, literally a five second … All in all probably a five minute endeavor. It’s worth a lot. The second piece is closing these deals. That can take on a buy side and a sell side you have to do it twice. That can take days. We’ve also made that a one day endeavor. That’s the whole point. Just efficiency. You want to be a deal maker. If you’re not a deal maker at heart … You know what, Jill, here’s my question to you. If you’re not a deal maker in your heart, do you think you can do well at this? Jill DeWit: No. Well, yes you could. I think you could. If you’re efficient and you have a system. You don’t have to be a deal maker. If you do nothing but send offers, close the accepted offers that come back, and just work on those, you could be just fine too. Jack Butala: Kind of touched the seller wants, say hello. “Sally is going to call you and close the deal.” That kind of thing? Jill DeWit: Yeah. I bet you could. Jill DeWit: I really think you could. Jack Butala: That’s about what we do now. A little bit more than that. Go ahead. Jill DeWit: You brought up something that’s a point I want to make too. People sometimes say, “Oh, but it’s more expensive.” I say, “Is it?” Then we go, “Oh, let me think. If I paid for someone to do this, and someone to do that, and someone do this. Oh, nevermind. Okay.” I’m like, “Yeah, that’s what I’m saying.” It’s not. Jack Butala: If someone says this is more expensive then just stop right there. Jack Butala: They don’t understand it. The people that are using it and call us every day, or send us notes everyday saying, “Thank God. Thank you. I can fire all these people now.” Or, not fire, but, “I can let these people go.” That’s who this product is for. If you have to question that then the product is not for you and that’s fine. Jill DeWit: We already have that right now, just the stuff that we’re able to provide and share right now with our mailer discounts, that’s just one example, it’s because of this large community. Because of all of us, we have a better rate and we can spread and share the wealth of all that. Jill DeWit: That’s what we’re doing with all these other things. Jack Butala: Do deals together. What’s that worth? Jill DeWit: Exactly. Thank you. That’s exactly what I wanted to talk about. That’s exactly the questions that I want you to cover and exactly what I want everyone to know. Jack Butala: Good. 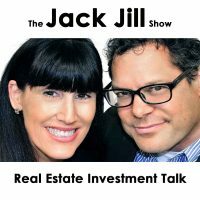 Join us on another episode where Jack and Jill discuss how to use information. That’s me. Jill DeWit: Use it everyday to buy property for half of what it’s worth then sell it immediately. Jack Butala: You are not alone in your real estate ambition. It’s Friday. Jill DeWit: I know. [crosstalk 00:12:33]. No, it’s not drunk Friday. Jack Butala: No. I need a bottle of water after that rant I just had. Jill DeWit: That was good. That was perfect. That was exactly … You touched on it. Like I said, there’s a lot of people right now that are already there and there’s a number of people that are just now starting to think like this going on. I feel it coming. Jill DeWit: I remember that for me. When I first started doing deals with you and I saw the day job. I remember thinking, “Wow, this is going to overtake all of this. Here it comes.” Boy did it. Jack Butala: It sure did. Jill DeWit: Look at us now. Jack Butala: I know. It’s purpose. Jill DeWit: Even now, today, Jack … This is so interesting too. You and I still could not possibly complete all the deals that we want to complete. Jack Butala: Isn’t that amazing. Jack Butala: I still look at our aging, though the stat that I look at on a day to day basis most often is our aging. When it get outs … One meeting, here’s the stat. It’s taken us longer than 30 days to close a deal in the system that I’ve approved then I have to say, “Oh, something is wrong. There’s just too many deals.” Yeah, you’re absolutely right, Jill. It needs prioritization. Jill DeWit: Right. On the flip side, we are not hurting for deals. Jill DeWit: I can be even pickier and we can pick the really, really great ones we want to spend our time on. Jill DeWit: It’s all good stuff. Jack Butala: Exactly. Information and inspiration to buy undervalued property on a Friday.